"Anyone would guess it was a prison. Its four-metre-high walls are topped with coiled barbed wire and punctuated with watchtowers. Its tall metal gates are locked. Yet a glimpse through one door, left slightly ajar, reveals its inmates died years ago. The site in Monrovia, Liberia's capital, is an abandoned cemetery where no one has been buried for decades. 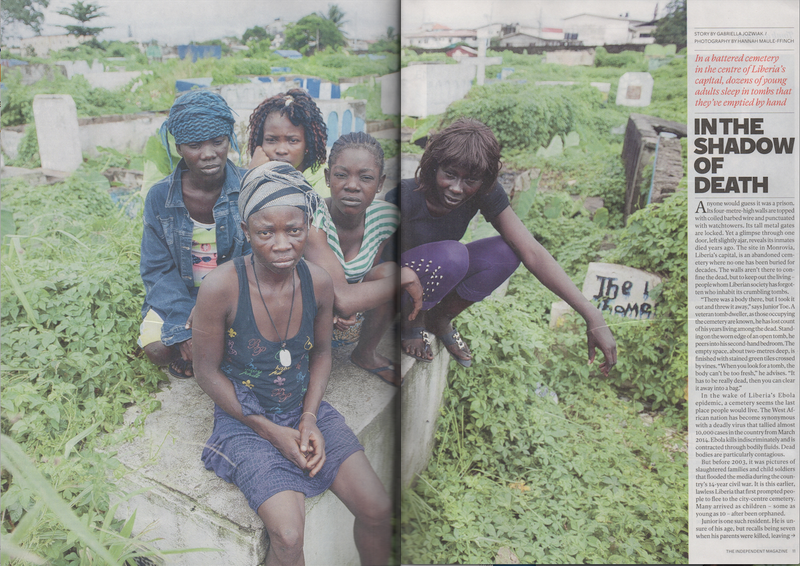 The walls aren't there to confine the dead, but to keep out the living – people whom Liberian society has forgotten who inhabit its crumbling tombs. "There was a body there, but I took it out and threw it away," says Junior Toe. A veteran tomb dweller, as those occupying the cemetery are known, he has lost count of his years living among the dead. Standing on the worn edge of an open tomb, he peers into his second-hand bedroom. The empty space, about two-metres deep, is finished with stained green tiles crossed by vines. "When you look for a tomb, the body can't be too fresh," he advises. "It has to be really dead, then you can clear it away into a bag..."
Read the full article on Independent.co.uk. I made two trips to Liberia to gather material for this exclusive story, which has never been reported before in the UK. It was only possible with the help of charity Street Child which is supporting the young people living in the cemetery. The pictures were taken by award-winning freelance photographer Hannah Maule-Ffinch. This is the first time i am reading about this place,It has such a hidden story that no one has ever heard about.Thanks for telling us.